When you are suffering from certain ailments it becomes necessary to make changes in your diet. Patients suffering from a disorder called diverticulitis also have to make changes in their diet in order to treat the ailment. Although there are many treatment options, a lot depends on what you eat and what you do not eat. This is a condition in which small pouches appear inside your intestine. Many people are affected with such a condition. Sometimes these pouches do not lead to any serious health problems. But in some cases, these pouches may turn inflamed and painful. This is referred as diverticulitis. 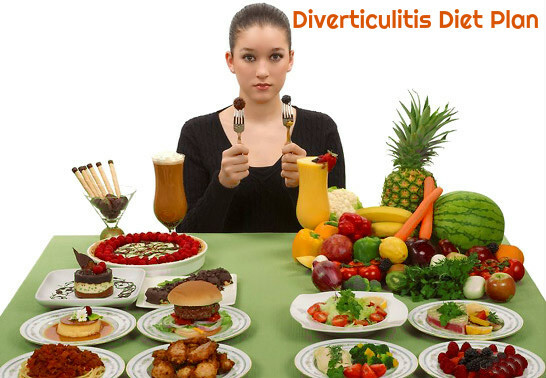 Here is how you can make some changes in your regular diet to treat diverticulitis. Fibre rich food is very effective for everyone. For patients suffering from diverticulitis, it is all the more important to include fibre rich foods in their diet. It is found that vegetarians who eat high fibre foods hardly develop this disorder, although the exact reason is still not clear. However most of the doctors are of the opinion that foods rich in fibre help in making the stool softer, and as it passes through the colon, it exerts less force on the walls of colon. When the food lacks fibre, the stool is harder and as it passes through the colon, more stress is applied on the colon walls. This may damage and rupture the pouches with the passage of time. Whole grains are rich in fibre. So have them instead of refined flours and grains, which contain less fibre. You can have brown rice, whole wheat bread and cereals to increase your fibre intake. Try to consume lots of vegetables and fruits. Have fruits like apples, berries and vegetables like carrots, artichokes and dark leafy vegetables. Try not to deep fry these vegetables, you can steam or bake them instead. Make sure that you drink plenty of water to increase the fluid intake to cope up with diverticulitis. Along with large amounts of water, you can also have vegetable soups, smoothies and broths. This will ensure that there is plenty of fibre and water in your diet. Homemade fruit and vegetable juice are also good. Eating nuts is also a good idea. This also provides you with fibre. Have legumes in your regular diet. Along with coping with diverticulitis, fibre-rich foods are also good for digestion. However, avoid over consumption of fibre rich foods as it can reverse things. When you have developed this condition, you have to avoid certain foods. You may be amazed that the same foods that help in preventing diverticulitis can also lead to it. It also differs with the stage of the ailment. As motioned earlier, whole grains, seeds and nut based food help in avoiding the development of this disease. However, patients who are in the acute stage of this disorder should avoid these foods as they do not suit them. If you are suffering from this ailment, it is important that you avoid eating hot and spicy foods. This means that you have to avoid eating fast foods, and dishes made by adding too much of chilli, pepper etc. Inflamed bowel cannot stand heat. While people suffering from diverticulitis benefit a lot by eating berries, they should avoid consuming strawberries. This is because the tiny outer seeds of strawberries can irritate the already inflamed bowel. Try to avoid consuming fatty or spicy foods if you are suffering from this disorder. Also avoid fried and deep fried foods as this can cause constipation and digestion problems. This can make the bowel condition worse. The symptoms suffered by one person affected by diverticulitis may vary from another person suffering from the same condition. While some foods help you to prevent this disorder, the same foods should be avoided once you are affected by this disorder. Make sure that you do not over eat fibre rich foods. If you take-in excess of fibre rich foods, you may have to face some issues. If you are not accustomed to easting fibre rich foods, make sure that you add it in to your diet gradually. This will give you the best results. Stick to a liquid diet when a flare up of diverticulitis occurs. This helps in soothing the colon muscles and sacs that are inflamed. You can have water, soups, broth and fruit juice. First you should have juices with no fruit or vegetable pulp, and then you can gradually shift to semi-liquid and regular foods. Once the symptoms start improving, you can have semi-liquid foods like pasta, canned and cooled produce, boiled fruit, eggs and some cereals with low fibre. You can have soft vegetables and fruits. You may also have fruit pulp. When you are recovering from this ailment, you may include dairy products in your diet. Have yogurt, pudding, cheese and milk at this time. Avoid high-fat foods if you suffer from pain in the stomach. You need not totally cut off animal protein form your diet. You can have well cooked and moist meat, like lean chicken, fish or turkey. You can also consume soft boiled eggs. Soy-based products are also good. Avoid high-fat meat in your diet. Wheat-based foods are also recommended, except for those who cannot digest wheat or are allergic to wheat. Such people may have potato starch flour, ground oats and rice flour instead of wheat. One thing to keep in mind is to avoid self medication. This can make things complicated. With proper diet and medication, you can treat diverticulitis. Lactose Free Diet Plan: What Foods you can eat?